In parts one and two of this series on DB2 health checks, we discussed the importance of regularly checking the health of your DB2 subsystems and applications. We also looked at some of the issues involved in a health check including figuring out the scope of what is to be involved and some of the considerations to ponder as you approach assessing the health of your DB2 environment. Of course, it is not really feasible to cover all of the components that you might need to address in your health checks in a series of posts in a blog. My true intent here is to get you to understand the importance of regularly checking DB2's health, instead of just plodding along and only making changes when someone complains! But even though DB2 health checks are important and crucial to the on-going stability of your systems, they can be costly, time-consuming, and valid only for the point in time(s) that you review. But maybe there is something else you can do to attack this problem? Instead of relying on outside experts to conduct your DB2 health checks you can instead rely on expert system software to provide a reliable, impartial analysis of your DB2 databases and applications. Such as solution is offered by Data Kinetics’ InnovizeIT Offline Analyzer for DB2 for z/OS. InnovizeIT is a planning and analysis tool that identifies mainframe DB2 bottleneck and performance degradation problems. DB2 performance and availability metadata is collected on the mainframe and downloaded to a Windows workstation. All of the analysis is performed offline, on the workstation, so there is no use of mainframe resources and no effect on mainframe performance. Runing the analysis on a PC workstation instead of the mainframe is an important feature in today’s world of cost-cutting and resource management. Most organizations are looking for ways to reduce their mainframe MSU consumption and would not really look too kindly on a big analysis job consuming a lot of mainframe CPU to analyze your DB2 environment. PC resources are frequently idle during off hours, so it makes a lot of sense to run the analysis on those under-utilized resources. The offline analysis process uses weighted analysis results with targeted and prioritized recommendations for fixing performance problems. The guided assistance InnovizeIT provides enables you to plan corrective actions and protect your budget regardless of static or dynamic SQL use, or variable workload processing. The results of the analysis are categorized and reported using an easy-to-navigate GUI. You can scan and review the problems identified by the analysis all on your PC workstation. There is no need to go back and forth between the mainframe and the PC because all of the relevant information is captured to allow the DBA to review the results of the analysis. The information displayed is context-sensitive depending upon the issue you are investigating and the report you are viewing. You can combine performance metrics from your DB2 performance monitor to add more detail to the analysis and reports. And you can send all of the reports to a spreadsheet for posterity and distribution to all of the DB2 DBAs, developers and, indeed, anyone interested. DB2 health checking should be a standard component of your DB2 database management procedures. Regularly examining your DB2 environment for problematic issues makes good business sense because it can improve performance and reduce costs. And InnovizeIT for DB2 for z/OS is a useful and cost-effective mechanism for conducting regular health checks. 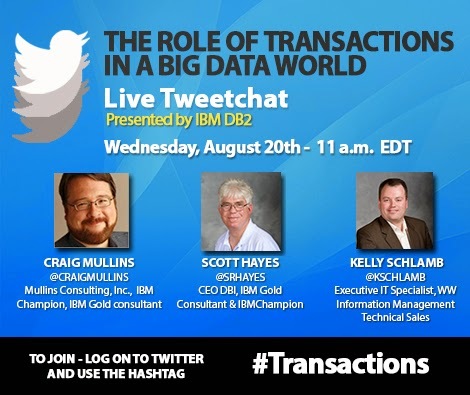 Today's blog post is an invitation to join me -- and several of my esteemed colleagues -- on Twitter on August 20, 2014 for a TweetChat on transactions. Now that sentence may have caused some of you to have a couple questions. First of all, what is a TweetChat? Well, a TweetChat is a pre-arranged conversation that happens on Twitter. It is arranged by an organizer (for this one, that would be IBM) and features several invited "experts" to discuss the topic at hand. But everybody can participate. All that you need is a Twitter account and the hashtag, which for this event is #Transactions. You can search for the #Transactions hashtag, and all of the tweets using that hashtag will show up. You can participate in the TweetChat simply by including the hashtag #Transactions in your tweets. Today’s blog post will be a short review of SHARE posted directly from the conference floor in Pittsburgh! For those of you who are not aware of SHARE, it is an independent, volunteer run association providing enterprise technology professionals with continuous education and training, valuable professional networking and effective industry influence. SHARE has existed for almost 60 years. It was established in 1955 and is the oldest organization of computing professionals. The group conducts two conferences every year. Earlier in 2014 the first event was held in Anaheim, and this week (the week of August 3rd) the second annual event is being held in my original hometown, Pittsburgh, PA. Now I’ve been attending SHARE, more regularly in the past than lately, since the 1990’s. But with the event being held in Pittsburgh I just had to participate! The keynote (or general) session today started up at 8:00 AM. It was titled “Beyond Silicon: Cognition and Much, Much More” and it was delivered by Dr. Bernard S.Meyerson, IBM Fellow and VP, Innovation. Meyerson delighted the crowd with his entertaining and educational session. Clearly, if you are a mainframer, there is a lot to digest… and a lot to celebrate. Perhaps the most interesting tidbit shared by Foley is that “PC is the new legacy!” He backed this up with a stat claiming that mobile Internet users are projected to surpass PC Internet users in 2015. Interesting, no? The presentation is based on a series of articles I wrote a couple years ago, but I am continually tweaking it to keep it up to date and relevant. So even if you’ve read the article, if you are at SHARE and a DB2 person, stop by Room 402 at 3:00PM… and if you’re not here, the articles will have to do! That's all for now... gotta get back to reviewing my presentation... hope to see you at SHARE this week... or, if not, somewhere else out there in DB2-land! In the first part of this series on DB2 health checks, DB2 Health Checks - Part One, I discussed the general concept of a health check and their basic importance in terms of maintaining a smooth-running DB2 environment. Today, I want to briefly look at how DB2 health checks are usually done... if they are done at all. 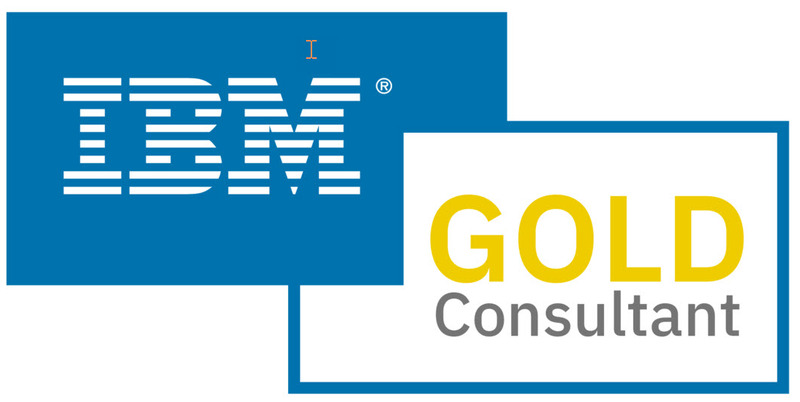 DB2 health checks typically are conducted by IBM personnel, a DB2 consultant, or a larger services firm. The engagement begins with experts/consultants interviewing the DBAs, submitting questionnaires as needed and collecting data from DB2. After collecting the data the consulting team goes off site and analyzes the reams of collected data. There may be intermittent communication between the consulting team and the on-site DBAs to clear up any lingering questions or to clarify things during the analysis phase. After some time (usually a week or more), a report on the health of your DB2 environment, perhaps with some recommendations to implement, is delivered. What happens next is all up to you. After reading the report you can ignore it, implement some or all of the recommendations, conduct further in-house investigation for the feasibility of implementing the recommendations, or send it along to management for their perusal. But there is a deadline involved. After all, your systems are not static. So the health check report is only as good as the point-in-time for which it was delivered. Time, as it always does, will creep up on you. If you wait too long, the recommendations become stale and you might not be doing the proper thing for your environment by implementing changes based on old information. Of course, when too much time has gone by after the health check, you could always engage with the services company and consultants again, requiring additional spending.